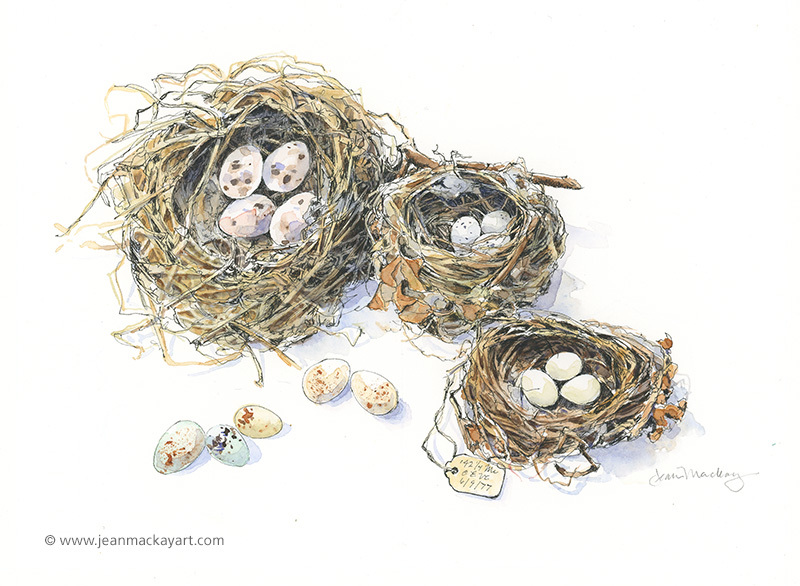 This entry was posted in Birds, Nest, Paintings, Watercolor and tagged bird eggs, natural history illustration, nests, Pember Museum of Natural History by Jean Mackay / Drawn In. Bookmark the permalink. wonderful work! You are great! Likewise, Margot. Your artwork is lovely! Thanks Patty Ann. Hope the tips are helpful! Beautiful drawing. 👏👏👏 nests have always been a challenge for me to draw. You make it appear easy. I’m going to put your tips to work. I hope they help! I do find it useful to stay very loose in the beginning and tighten up as I go. You can decide how detailed you want to be…you can suggest a lot without drawing every twig. What a good ritual each year and the nests are exquisite! It is a great ritual. I tend to always go in February or March, when I need an artistic boost to get me through to spring. No kidding, Janice! I’ll be darned! I live not far from the Taconics and the Berkshires, but didn’t realize they ran up on the edge of Vermont. Thanks for making the distinction. The description of your day, the drive, coffee, the cases, the anticipation, the drawing – it’s quite delicious! There should be many more small, local natural history museums. It really is a day I look forward to and thoroughly enjoy each year. Those old collections went out of fashion, but they are so remarkable when you find them! I love your nests, this set is exquisite. The warm tones of browns and I bet their is purple in there somewhere! Yes, some purple. The pigments that make the color and markings on bird eggs come from just two pigments– a reddish brown and a blue-green. Mix those together (or not) and you get an amazing array of colors and patterns. Many eggs have pale purple marks overlaid with stronger browns and nearly black marks. I use a fairly limited palette when mixing egg colors and its always a challenge to get them to take shape. Beautiful rendering and Wonderful ritual :)!